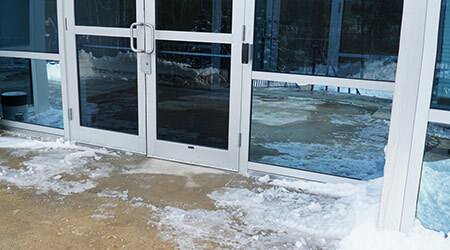 Ice melt products used in parking lots and on sidewalks are designed to help building owners and managers keep their facilities safe. And these products are especially needed in fast food and quick service restaurants, where people are coming in and going out throughout the day. But, ice melt can play havoc on indoor floors. In fact, some fast food restaurants would prefer not to use ice melt at all. But slips and falls present such a huge liability issue for them, most owners and managers realize they have no choice but to use it. About that “havoc” on floors, we must remember that most ice melt products contain calcium and magnesium chloride, a type of salt that can leave an oily and/or powdery residue on floors as it builds up. It can also damage natural hardwood floors and eat away at the finish on tile and other types of hard surface floors. If ice melt works its way into the grout and underneath the floor, it can damage the grout and the adhesive holding the tiles may weaken. In such cases, the floor may need to be repaired. If that was not enough, things get even worse when ice melt is placed around a busy fast food restaurant located in a heavily industrialized area. Then the ice melt not only can damage the floor, but because it is mixed with mud, grease, and oil, that “havoc” on floors can be even worse. This is precisely what was happening in a Canadian quick service restaurant. According to Patricia Brière, a territory manager for Avmor, manufacturer of professional cleaning solutions, this facility was very busy and located in one of Quebec’s major industrial areas. Brière says they tried a few different ways to clean the floor and remove the soiling, even scrubbing the floor with powerful degreasers. However, what proved most effective was a product manufactured by Avmor called EP88 Caprice. The product was tested in different sections of the quick service restaurant’s floor. © 2019 MN Services, Inc. All Rights Reserved.